Type: Moccasin Slippers. Color: Sliver / Grey. (Indoor outdoor sole. Color: purple. I will gladly answer as soon as I can. I always list all defects and put a picture). Size: M 6.5-7.5. Isotoner Clog Slipper. 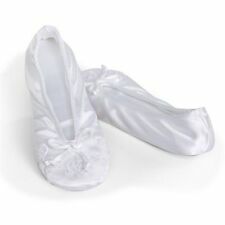 Isotoner slippers are fully machine washable. Provides the ultimate in cushioning. Rubber outsole for increased stability. There is not a box. I will resolve your issue. That's a Promise! Do not buy if you are not OK with this. (Color: white. I always list all defects and put a picture). I will gladly answer as soon as I can. Size: 8.5-9. Length (Heel to Toes): 9.5". The rubber around the bottoms is dirty. Shoes are in pre-owned condition and shows signs of light wear. Length (Insoles):9". Width: 3.5". These pretty majestic purple (color shown) slippers feature: round toe; comfortable covered cushioned footbed; sure grip soles for safety; machine washable. Special EVA heel cushion absorbs impact for extra walking comfort. Unique footbed design provides the ultimate cushioning experience. 72 hours upon receiving your item if it does no fit. 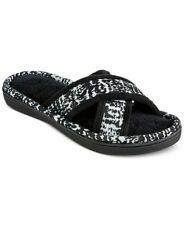 Isotoner Gray Slippers With Aztec Trim Size 8.5- 9. Shipped with USPS Parcel Select Ground. Machine washable. Non-skid indoor-outdoor hard sole. Cushioned footbed with enhanced heel cushion. Black, soft mock suede upper, warm and plush sherpa like lining. Slip on, cushioned insoles, rubber outsole, indoor / outdoor. Brown, soft mock suede upper, warm and plush sherpa like lining. Slip on, cushioned insoles, rubber outsole, indoor / outdoor. ISOTONER Womens SMARTZONE GEL Comfort Tech CHESTNUT Size 9.5 - 10 Worn Once! Your foot will be cushioned with soft foam for your comfort. • Microterry lining will keep your feet warm and toasty. We do our best to process as quickly as possible. We stand behind our products. If you brought the wrong item, you will be allowed to be replace with the correct item only. Cushioning in the heel. Color Black.